Here’s what’s up in the world of TV for Thursday, August 25. All times are Eastern. Ripper Street (BBC America, 6 p.m.): A star football player winds up dead in the latest episode of this British murder mystery series. Which puts BBC America in a rather tight spot: Do they embrace the first half of their name and boldly stick with football as the correct term for the sport involving a black and white ball? Or do they lean into their “America” branding and redub the entire episode so that the actors now say “soccer”? It’s an intercontinental conundrum! Steven Universe (Cartoon Network, 7 p.m.): After visiting the library together last week, tonight Steven and Connie get a lesson in focus and concentration as they continue their secret training. Information about “Mindful Education” has mostly been kept under wraps, which makes Eric Thurm wonder whether it’ll be a game-changer for Steven Universe. 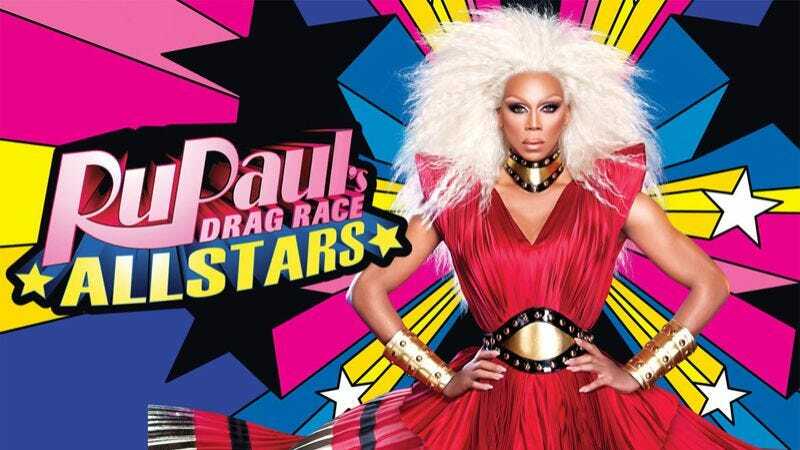 RuPaul’s Drag Race All Stars (Logo, 8 p.m.): If there’s one thing better than RuPaul’s Drag Race, it’s RuPaul’s Drag Race All Stars, which brings back the best and the brightest of Drag Race’s past contestants. Adore Delano, Alaska, CoCo Montrese, Detox, Tatianna, and Phi Phi O’Hara are among the queens returning for a second chance in the spotlight. That means more drama, more shade, and much, much more sashaying away. Behind Bars: Rookie Year (A&E, 10 p.m.): Much as History Channel revamped its brand to center on aliens, A&E is apparently trying to do the same for prisons. Just a week after 60 Days In debuted its second season, Behind Bars: Rookie Year also returns for a sophomore outing. Like the first season, the second will follow corrections officers in their first year on the job. Or you could just do yourself a favor and read that Mother Jones piece on being a guard at a private prison instead. Desert Flippers (HGTV, 11 p.m.): Only time will tell whether this new HGTV show is more Flip Or Flop (i.e., terrible) or Fixer Upper (i.e., great). But either way, it follows a similar model as both of those shows: A real-life couple with some adorable kids turns rundown houses into dream homes. The twist here is that Eric and Lindsay do their house flipping in the deserts of Palm Springs, California. Let’s hope they packed sunscreen. While other reality shows pit their contestants against each other and craft villain narratives, and scripted dramas fall over themselves to explore the dangers of trusting others, here is a series that depicts the brightest sides of each of its bakers, even when they don’t quite believe in themselves. On The Great British Baking Show, if contestants are given the opportunity to do so, they will surprise even themselves. This unwavering faith, this belief in the decency and inherent kindness of other people is painfully underrepresented on television right now.